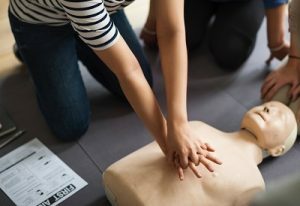 CPR Educators is dedicated to helping people across Chapel Hill learn life-saving and safety skills through our CPR Classes, first aid training, and emergency training courses. We host multiple classes each month at our American Heart Association Training Center in Chapel Hill, and each class is taught by an experienced certified instructor with emergency service experience. Students not only learn the skills needed to pass the certification tests, they also learn how to apply these skills in the event of a true emergency situation, and they learn them in a personalized, engaging manner thanks to our small class sizes. Why Are Chapel Hill CPR Classes Important? Many of our students register for CPR classes and first aid courses because they are required to by their employer. However, we teach more than just the skills it takes to pass an assessment. There’s no doubt that CPR and first aid save lives. In the time between an emergency happening and EMTs arriving to the scene, CPR can prevent brain damage and even death. Our classes give you the ability and confidence to take the lead during an a life-and-death situation. Whether it’s a child you’re caring for, a patient at your therapy center, or even the person in line at the bank, CPR Educators makes sure you have the training to come to that person’s aid and improve their chances of a positive outcome. We offer four different emergency training courses at our Chapel Hill training center, plus we offer a hybrid online class option. Each class is small, not only so we can offer personalized, hands-on experience in a shorter period of time while also making sure the class is fun, exciting, and engaging! Pediatric CPR and first aid are very different than CPR for adults, and this course provides in-depth instruction in how to provide emergency care for babies, toddlers, and children. The Basic Life Support (BLS) CPR class teaches healthcare professionals how to perform CPR and provide cardiovascular life support in hospitals, healthcare settings, and in a pre-hospital setting. Heartcode® BLS is designed for students who enjoy learning on their own. Part of this course is completed online, while there is a brief in-person class for hands-on learning and to assess skills. For employers whose employees need to meet OSHA Standard 1910.1030 regarding bloodborne pathogens, this class teaches students how to stay safe when dealing with blood or other bodily fluids. We offer several classes throughout the month at our American Heart Association Authorized Training Facility. Whether you need to renew a current CPR certification or you’re a new parent who wants to be familiar with first aid in the event of an emergency, we have the class you need at a time that works for you. For organizations who want to ensure their team is certified in CPR, first aid, or OSHA-required skills, our instructors provide on-site classes. Whether you have a small business or a large organization, our instructors can provide small, customized classes that are perfect for nursing homes, day care centers, home health businesses, and dentists’ offices. We are dedicated to teaching lifesaving skills to those in and around the Chapel Hill area! Reach out to us today at (919) 639-4848, send us an email, or fill out our contact form to learn more about our services.